Do you have all of your positions filled? So, DO you have all your positions filled? I so remember the anxiety of vacancies! Seems like when we had plenty of applicants, we wouldn't have "permission" to hire yet. Then when we would finally get the go ahead, the applicants would have already taken positions! And that was in the areas where there were plenty of applicants ... certainly not the tough areas — teachers of the deaf and hearing impaired, the perennial shortage of Speech and Language Pathologists, and others! We built up a nice program for students with hearing impairments/deafness and I got many of my teachers by recruiting at Gallaudet when I was on meetings in D.C. in July — another reason to go to the Legislative Summit each year! I would set up interviews either the day before or the day after the CASE executive committee meeting! And, have you tried using the CASE Career Center We had several of our members indicate there was a need for a career center so we started one on our website about a year ago. Did you know CEC also has a career center. I have always believed you have to look in every place possible so be sure and check out the CEC CAREER Center too. Speaking of CEC and resources... Have you encouraged your teachers to sign up for the CEC Tool of the Week? Actually it would be great for you to sign up for the weekly email. And while we are on CEC resources and teachers, I hope you are encouraging your teachers to join CEC and your administrative staff to join CEC and CASE! Almost all articles on retention and/or burn out list one of the big variables for educators leaving the profession as feeling a lack of support. Being a part of a professional association/community can go a long ways in retaining teachers and staff as well as providing great instructional strategies and leadership hints! Do you have a local CEC Chapter? Maybe that would be a great goal for your department this year. Establishing a local chapter could be a great "leadership" builder for your staff! IF you are interested in getting more information on starting a local chapter, contact the CASE membership chair, Julie Bost (NC) and she and I will get you the information you need! Speaking of Membership... Do you understand the CEC membership options? We have all been so surprised that more people haven't joined now that there is an option that is just $65! The CEC Basic membership is mostly electronic but it still has all the member privileges and you can then join CASE and the total is just $125! Of course if you want the Full membership which gives you even more resources including one free webinar, it is only $115 so with the CASE division it is only $175. Then there is the Premier membership which not only has all the print and electronic but also includes 2 free webinars and partial credit for a division so with the $205 rate plus only $25 more dollars to add CASE, you can be a CEC Premier and CASE member for just $230, what a deal! Check out the CEC membership benefits on this chart. If you are not a member of CASE, now is a great time to get that membership in. We are about to go to press on our Lucky 21 # 7 and when it is printed, every member of CASE will be mailed a free copy! But only CEC/CASE members will be receiving these so get that membership in today! There is still plenty of time... Even though you may have missed the Early Bird registration for the 26th Annual CASE fall conference, it is still a bargain at member price of only $400! That price includes all the handouts, lunches on Thursday and Friday, full breakfasts on Friday and Saturday, and Break on Thursday and Friday, and think of all the networking, too! We have over 40 breakout sessions, the schedule is still tentative. Be sure to register soon, and to get your hotel room at the Atlanta Hyatt Regency be sure to use the access code: case! Or go to the CASE home page! 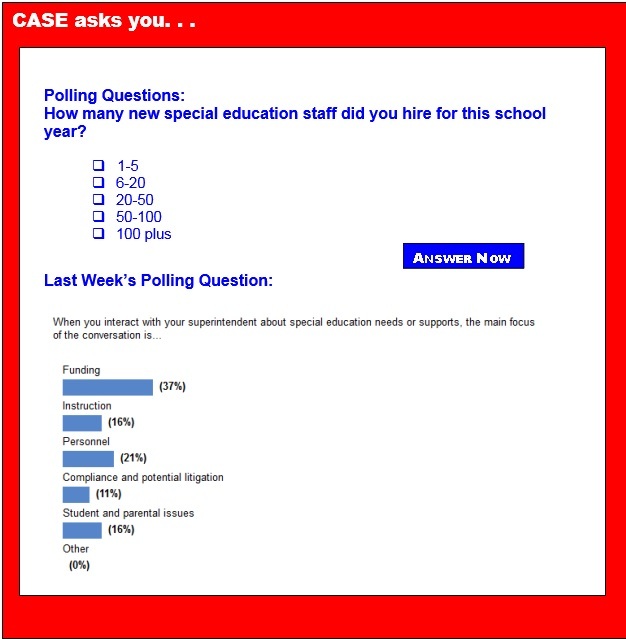 Last week, the Poll asked, "When you interact with your superintendent about special education needs or supports, the main focus of the conversation is..." and those who answered the poll were pretty evenly divided! The answer that got the most votes at 37 percent of those answering the poll said funding. Second place was tied at 21 percent between personnel and student/parent issues. Instruction came in at 16 percent and compliance and litigation issues came at only 11 percent! The results are not surprising to me as it used to seem EVERY day presented a different set of "opportunities" as my mentor Gloria Frankum used to say! She always said, we do not have problems, only varying degrees of opportunities! Hoping you will only have good opportunities to greet you this Monday morning! Thanks for all you do all the time for so many! Survey | What is the capacity for hearing screenings in your district? READ 180, the leading blended learning solution, will prepare your students receiving Special Education services for the rigorous expectations of College & Career. Key program designs and state-of-the-art planning and assessment tools help educators target specific skill deficits and unique instructional needs as outlined in an IEP. Learn to develop reading, spelling, and comprehension. Join us for highly interactive Lindamood-Bell Workshops, where our experienced presenters will instruct you in the steps of our programs. Recently, the U.S. Department of Education released a new report outlining the unmet need for high-quality early learning programs in America. Roughly 6 in 10 4-year-olds are not enrolled in publicly funded preschool programs, and even fewer are enrolled in the highest quality programs. Last fall, things were not going well in several classrooms at Middle School 223 in the Bronx. One boy in an eighth grade classroom wouldn't stop bothering the kid sitting next to him — he was constantly being written up for talking in class. A sixth grade girl in the back of the class had yet to utter a word all semester. For MS223, located in the poorest congressional district in the United States, it was just another day of behavior problems and kids who couldn't seem to be bothered to pay attention. But a week later, everything changed. The boy who couldn't stop bothering neighboring students suddenly quieted down and began paying attention. The girl who hadn't said a word started speaking. The difference? The kids got glasses. As school gets underway in many parts of the country, federal officials are doling out millions of dollars to help parents and teachers better serve students with disabilities. The U.S. Department of Education said it will grant $14 million to support parent training and information centers in 28 states and two U.S. territories over the next five years. The centers, which are located in each state, are designed to offer parents assistance with everything from understanding special education law and policy to interpreting results from evaluations. School discipline is frequently viewed as a school- and district-level issue, but state boards of education can also play a role in determining that policies and practices are fair and effective, a new guide says. The guide, by the National Association of State Boards of Education, provides suggestions for states to get involved in the growing discussion around reducing the use of suspensions and expulsions and ensuring that children of all races, ethnicities and sexual orientations are treated equitably under school policies. Although districts are required to provide students in need with special education and related services such as speech therapy, many face obstacles in doing so. One such school district, Lone Pine Unified, an economically disadvantaged district near the California-Nevada border, found it hard to recruit and retain speech-language pathologists because of its location. To overcome this challenge, LPUSD chose to use online speech therapy through PresenceLearning and is seeing great success. With one in 68 children being diagnosed with autism spectrum disorder, the condition is evidently on the rise across the country. According to the U.S. Centers for Disease and Prevention, this current autism diagnosis rate represents a 30-percent increase since 2008. In order to raise ASD awareness and assistance, the National School Transportation Association and the Autism Society have partnered to provide school bus contractors the necessary training and information about the disorder. The number of American children with attention-deficit/hyperactivity disorder is rising, U.S. government experts say. And it's important for the disorder to be recognized and treated. Untreated ADHD can cause serious problems for children, such as falling behind in school, difficulty making and keeping friends, and having conflicts with parents, according to the American Academy of Child and Adolescent Psychiatry. Restraint and seclusion in schools, particularly when used with students with disabilities, has been a simmering national issue for years. But when video of a Kentucky school resource officer handcuffing an 8-year-old boy was released earlier this month by the American Civil Liberties Union, debate over the practice of restraining students erupted anew. The ACLU filed a lawsuit against the school resource officer, Kevin Sumner, and his employer, the Kenton County, Ky., sheriff's department. Having a regular schedule matters — especially when it comes to young people of all ages. According to a new research brief from the nonprofit Economic Policy Institute, children of parents working non-standard and unpredictable schedules are more likely to have decreased cognitive and behavioral outcomes.